It's winter time and that means dry, cracked and painful hands for many of us, including me. It usually takes me ages to find a hand cream that is not too greasy or too thin, which means that over the years I have build up a few favorites and dislikes. 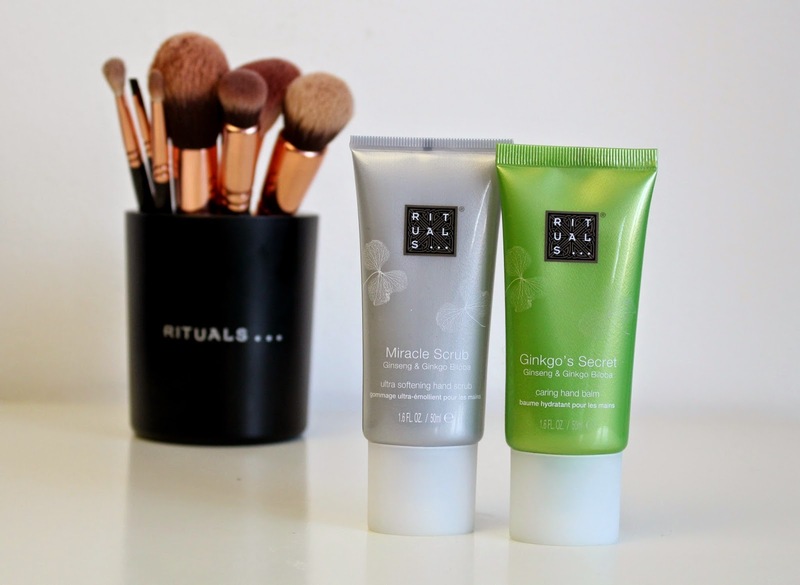 This time, I tried out the Ginseng & Ginko Biloba Miracle Scrub and the Ginseng & Ginkgo Biloba Ginkgo's Secret hand balm from Rituals. I usually love Rituals, so I was very curious about these two. Do I add these to my favorites or not? I had never tried a hand scrub before, but always wanted to. This hand scrub is supposed to be ultra softening. You apply a bit to dry hands, rub it in your palms and then spread it all over your hands (don't add water). Rinse it off and that's it! The scrub is really soft and leaves a bit of a moisturizing layer, even after rinsing. The scent is just amazing! I love the consistency of this hand balm. You only need a little bit for both your hands. The balm is thick but easy to spread. It leaves a little (non-greasy) layer on your hands that feels almost like a serum or primer. Again, the scent is just amazing. It is safe to say that this is my new favorite hand cream! The price: both the scrub and balm are a bit pricy as it is not your average drugstore hand cream. For the both of them together you would pay about 22 euros (thankfully my dad gave them to me). However, as I said, you only need a little bit of both products, so I expect them to last long.